This Bookreporter.com Special Newsletter spotlights a book that we know people will be talking about this spring. 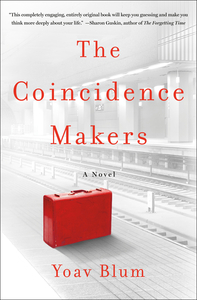 Read more about it, and enter our Spring Preview Contest by Friday, March 16th at 11:59am ET for a chance to win one of five copies of THE COINCIDENCE MAKERS by Yoav Blum, which is now available. Please note that each contest is only open for 24 hours, so you will need to act quickly! In this genre-bending novel, there is no such thing as chance and every action is carefully executed by highly trained agents. You’ll never look at coincidences the same way again. Enter the Coincidence Makers --- Guy, Emily and Eric --- three seemingly ordinary people who work for a secret organization devoted to creating and carrying out coincidences. What the rest of the world sees as random occurrences, are, in fact, carefully orchestrated events designed to spark significant changes in the lives of their targets --- scientists on the brink of breakthroughs, struggling artists starved for inspiration, loves to be, or just plain people like you and me. - Click here to visit Yoav Blum's website. - Connect with Yoav Blum on Facebook and Twitter.